21 Grams Of Protein! 3 Grams Of Carbs! 100 Calories! Egg White Protein. Why Paleo Protein? 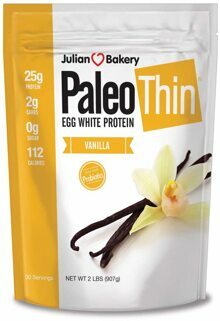 Paleo Protein 100% egg white protein is truly a pure form of protein. It can be easily mixed with just a spoon. Sourced from egg farms in the U.S.A. that treat their chickens humanely. Our high protein, easy-to-digest formula can help you reach or maintain your wellness and weight loss goals. Paleo Protein is easily blended with organic stevia or monk fruit for extra sweetness. Our protein is gluten-free, whey-free, soy-free and not genetically engineered. Egg white protein such as Paleo Pure Protein has a complete essential amino acid profile, which promotes optimal recovery from challenging workouts. If you're looking for the best protein on the market, then look no further! Our Paleo Protein is easy to digest, tastes delicious and is 100% Paleo. It can be taken before meals or between meals to help curb hunger and boost energy levels. Our protein powders do not clump and are easy to mix. This unique formula is flash frozen into powder so that the protein is not damaged. Each scoop has only 100 calories, 21 g of protein and 3 carbs! This Optimal Paleo Protein Supplementation: Assists with Weight Management. Improves Muscle Strength. Helps with Overall Health & Sense of Well-Being.